Looking to travel to the beautiful Emerald Isle? 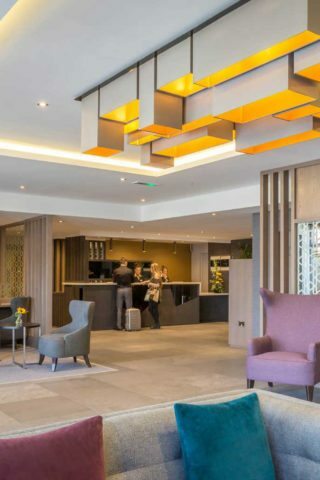 Look no further than Maldron Hotel Newlands Cross which is your perfect springboard to explore Dublin’s fair city and all Ireland has to offer. As soon as you enter our doors, you are greeted with a “Cead Mile Failte”, a hundred thousand welcomes, ensuring that you experience the best Irish hospitality during your visit along with a cold pint of Guinness in our Bar & Lounge . We are located about a 20 minute drive from Dublin Airport by car or taxi and approximately 40 minutes by using the Airport Hopper when availing of the Airport to Tallaght route. The hotel is also located just off the N7 allowing for you to explore more of what Ireland has to offer as it is a direct link to the south and west of the country. Maldron Hotel Newlands Cross is a 15 minute walk from the Red Cow Luas stop which is a light rail tram system that will bring you right into the heart of Dublin City. Prefer to travel along the scenic route? Both the number 13 and 69 bus will deliver you safely into Dublin city and the bus stop is only 5 minutes away from the hotel. After a day of exploring Dublin or going on a shopping spree, don’t forget to pay a visit to Temple Bar right in the heart of Dublin to soak up the atmosphere and witness traditional Irish music and dancers all while enjoying a pint of the “black stuff”. Walk down the famous cobbles and immerse yourself in Irish culture. Maldron Hotel Newlands Cross is based just outside of the historic town of Clondalkin. The village of Clondalkin is home to only one of 4 remaining round towers in Dublin. Clondalkin Round Tower was built in 7th century and has recently gone through a restoration with a visitors centre also built in the vicinity. If you are looking to immerse yourself in Dublin’s steep history or enjoy a relaxing vacation, Maldron Hotel Newlands Cross offer you a stress free break with the opportunity to explore our fair city. Click here to book your vacation with us today and experience the craic!